Ahhhh, the kitchen. It's the room where we spend most of our time. Cooking, eating, chatting, doing homework, entertaining - it's really become the place to be in most people's homes. Because of that, it's my favorite room to design right now. Pinterest is a great resource because there are so many rockin' designs being posted everyday. 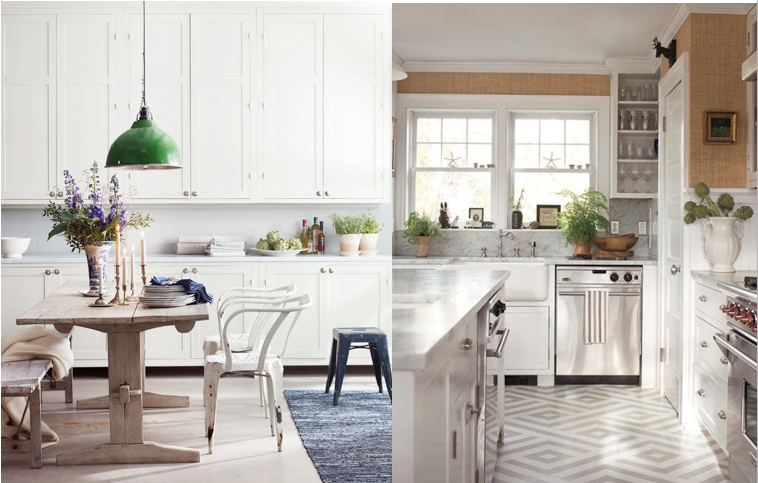 You can't go wrong with a clean, white kitchen. These both feel timeless and fairly traditional, but were done differently. The first one uses all cupboards for storage, including ceiling-height uppers. They added warmth with a farm table and some vintage metal pieces. The second one uses a mix of drawers and cupboards, along with open shelving up top. It has a grasscloth wallpaper for a warm touch and a carrera marble backsplash. I'm in love with the geometric pattern on the floor, but overall I prefer the first one. Gray and Blue! I absolutely love the current trend of gray and blue kitchen cabinets. I actually grew up in a modern house with cobalt blue cabinets and a white counter, so maybe it just feels like home to me. These two are both gorgeous in completely different ways. The first one uses a nice, charcoal gray (with purple undertones?) on all the cabinets, but is balanced out with crisp, white walls, white marble counters and light oak floors. The second one really went for it. The high-gloss blue (almost teal) is used from floor to ceiling for real impact and the dark gray countertops just kind of disappear in the middle. The dark wood floors add warmth and take it in a more traditional direction. I totally dig both of them, but prefer the crisp contrast and the more soothing colors in the first one. Copper and other metalics are all the rage right now, and I'm loving it. In the first one, it's just used as an accent in the light fixtures. It's a fairly traditional kitchen, but uses the current "dark lower/ white uppers" color scheme and some industrial bar stools to give it an updated look. The addition of the copper fixtures feels really fresh and unexpected. Then there's the second one. They took a very small space and made a major impact by painting all of the cabinetry in a metallic gold. It works because it's a galley kitchen with very simple, modern cabinets. It's balanced out by white and gray marble and looks pretty stinkin' cool if you ask me. There are just so many ways to go. The hardest part is narrowing it down and actually deciding what to do. But that's also the fun part!! Email me pictures of your kitchen and I'll post a bunch in a Readers' Reside story soon.